WASHINGTON, D.C.—Apartment markets improved across all areas for the seventh quarter in a row, but the pace of improvement moderated according to the National Multi Housing Council’s (NMHC) Quarterly Survey of Apartment Market Conditions. 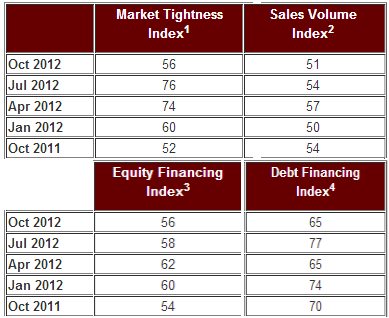 The survey’s indexes measuring Market Tightness (56), Sales Volume (51), Equity Financing (56) and Debt Financing (65) all measured at 50 or higher, indicating growth from the previous quarter. Marking the 11th straight quarter of the index topping 50, the majority (62 percent) reported stable market conditions. 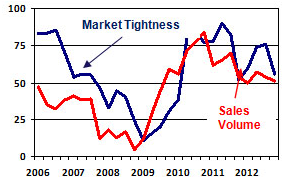 One quarter reported tighter markets and 14 percent indicated markets as looser. For the eighth consecutive quarter, “unchanged” was the most common response (49 percent), compared to 24 percent who indicated tightening conditions and 21 percent who said sales volume was lower. Only one in five (21 percent) reported acquisition capital being similarly available for all geographic markets and properties. Construction financing was even more restricted. Just 8 percent of respondents indicated construction financing for new apartments was available in all markets for all property types. The vast majority reported construction financing as only available for either the top properties in the top markets (37 percent) or for all property types in the top markets (36 percent). Dipping two points to 56, the Equity Financing Index remained above 50 for the 13th quarter in a row. 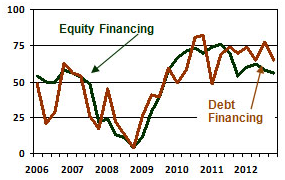 However, 14 percent reported that equity financing was less available, up from 9 percent last quarter. This compares to 26 percent who reported equity as more available and 56 percent reporting no change this quarter. The Debt Financing Index declined from 77 to 65, but only 9 percent believed that borrowing conditions for debt financing had worsened–the seventh consecutive quarter in the single digits. About the survey: The October 2012 Quarterly Survey of Apartment Market Conditions was conducted October 15-22, with 89 CEOs and other senior executives of apartment-related firms nationwide responding. Based in Washington, D.C., NMHC is a national association representing the interests of the larger and most prominent apartment firms in the U.S. NMHC’s members are the principal officers of firms engaged in all aspects of the apartment industry, including owners, developers, managers and financiers. One-third of Americans rent their housing, and over 14 percent live in a rental apartment. For more information, contact NMHC at 202/974-2300, e-mail the Council at info@nmhc.org, or visit NMHC’s web site at www.nmhc.org.